This October, Hali’imaile General Store will begin a year of celebration to mark their 30th year in business on Maui. Please mark your calendars to celebrate on the 30th of each month beginning in October 2017. Please note that the specials and promotions below cannot to be used with any other promotion. October 30th 2017– Our new fall menu launches! Featured on this menu is our retro dish, Schezwan Barbecue Salmon, from our 1995 menu. To celebrate the beginning of our 30th year in business on Maui, on October 30th, all dinner entrees are $30! November 30th 2017– Lunch and dinner at Hali’imaile General Store on November 30th with feature a short menu of our vintage menu items from November 30th, 1988 for one night only! December 30th 2017– Stop in to Hali’imaile General Store to toast the new year and order one of our three vintage cocktails featured this evening only! January 30th 2018– On January 30th, Hali’imaile General Store will offer a Lobster Boil menu item, complete with all of the delicious trimmings! Make your reservation for this special night! February 28th 2018– At Hali’imaile General Store, we will be celebrating the Chinese New Year with vintage Chinese influenced dishes such as duck with steamed buns, firecracker shrimp, and more. March 30th 2018–Celebrate Easter Sunday Brunch with us on Sunday, April 1st! April 30th 2018–To commemorate our 30th Anniversary, for dinner service only on Monday, April 30th, each guest that orders an entrée will receive a complimentary take home dessert. In addition, Hali’imaile General Store will also be participating with the island wide benefit for the Maui Humane Society, celebrating National Adopt A Shelter Pet Day on the same evening. Bev will donate $1 for every entrée purchased to benefit Maui’s homeless animals. It’s almost May Day! Stay tuned for our upcoming May promotion! May 30th 2018 – 100 + Women who care Event will be held at Hali’maile General Store. For more information, please visit 100+ Women Who Care’s website. June 30th, 2018–“Pig and Pinot” event that will highlight Bev’s favorite BBQ dishes and a featured winery. RSVP for this special event will begin in early May. July 30th 2018– Our next special event will feature our neighbors, Hali’imaile Distilling Company and their spirits. The pairing night – Three course paired with mini cocktails featuring our Hali’imaile Distilling Company infusions. RSVP for this event in early June. August 30th 2018– On August 30th, Hali’imaile General Store will host a “Burgers and Brews” Night, featuring a special Burger menu with pairing from Maui Brewing Company. RSVP for this special event in early July. Sept 30th 2018–“Tacos and Tequila” night will be the last of our summer events, and will featuring a special Tex Mex menu and Tequila pairing! October 14th 2018– Hali’imaile turns 30 years old! Mahalo to our Maui community for supporting our business and allowing us to create memories with you! Special event in October 2018 to celebrate, details to follow. 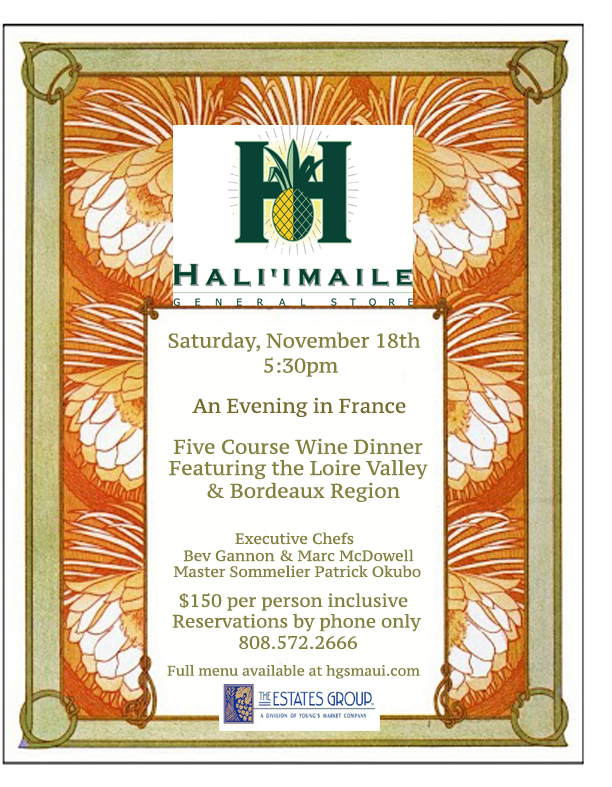 Hali’imaile General Store presents An Evening in France Wine Dinner on November 18th, at 5:30pm. A beautifully crafted five course meal will be paired with wines from the Loire Valley and Bordeaux Region. Master Sommelier Patrick Okubo will be on hand to connect with diners about the wines they are experiencing from The Estates Group. 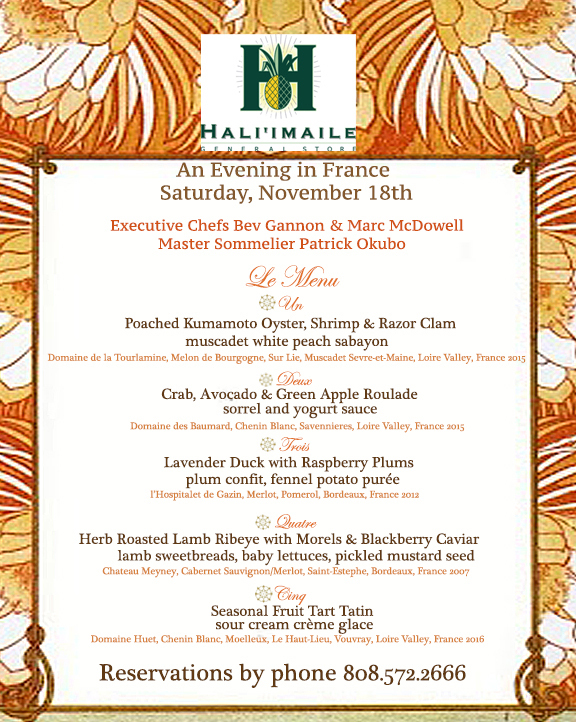 The delicious menu, outlined below, will be presented by Chef Beverly Gannon and Executive Chef Marc McDowell.